Edit: Updated and completed prompts are available in a printable version through etsy and an ebook version through amazon as of December 2018. Again thanks to everyone who has been sharing the previous months' journal posts. I'm so glad to hear from those of you who are using these prompts in your own journals. 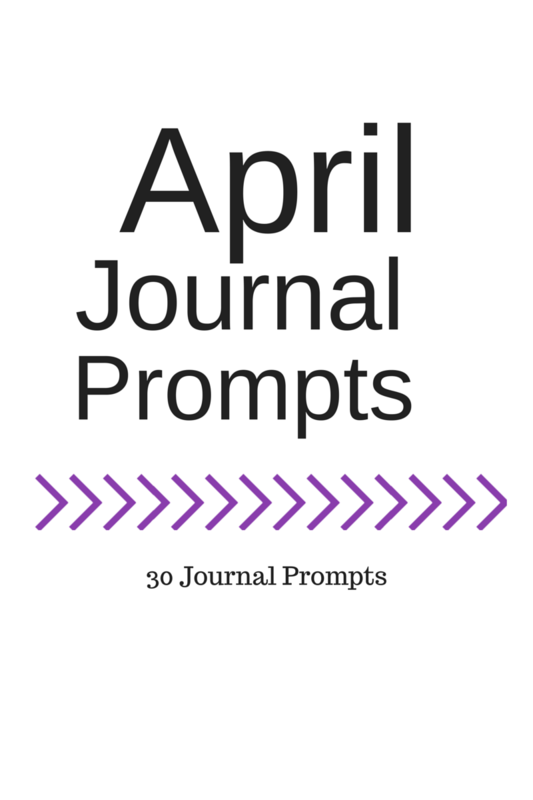 This month, I am happy to share 30 new journal prompts for you to use. Pick a time out of your day to sit down with a hot beverage and spend some time writing. A printable version of these prompts is available at the bottom of the post. If you have never journaled before, or if you want some pointers on starting your journal, check out our post on starting a journal. 2. What place do you consider your home? 11. How important is fame? 12. What is a "perfect" day? 13. How do you make decisions? 18. How would you like to be described? 20. Would you like to know about the future? 21. How do you show people you care? 28. Where you want to be? Download your printable PDF version of the prompts here. Make sure that you get next month's prompts by following along with Life of Lovely on bloglovin, pinterest, or twitter. We'd love to hear from you if you decide to use these prompts. Let us know how it goes in the comments. 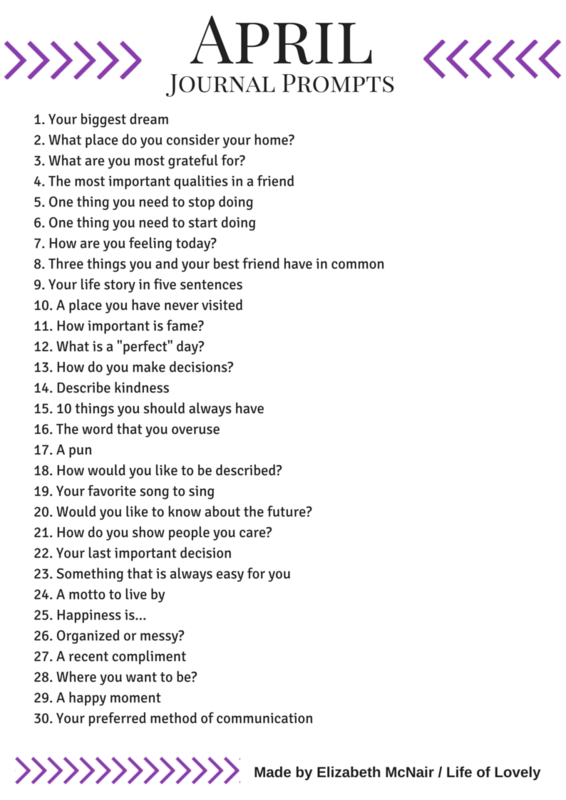 What a great list of prompts! I journal, but only when I remember or feel the need to get some thoughts out. I would love to journal daily and maybe with these prompts I can start to make that happen! Thanks for sharing this! Great list! I'm trying to deal better with my anxiety this year and thinking about starting a journal to help. I have pinned these incase I do start! Thanks! 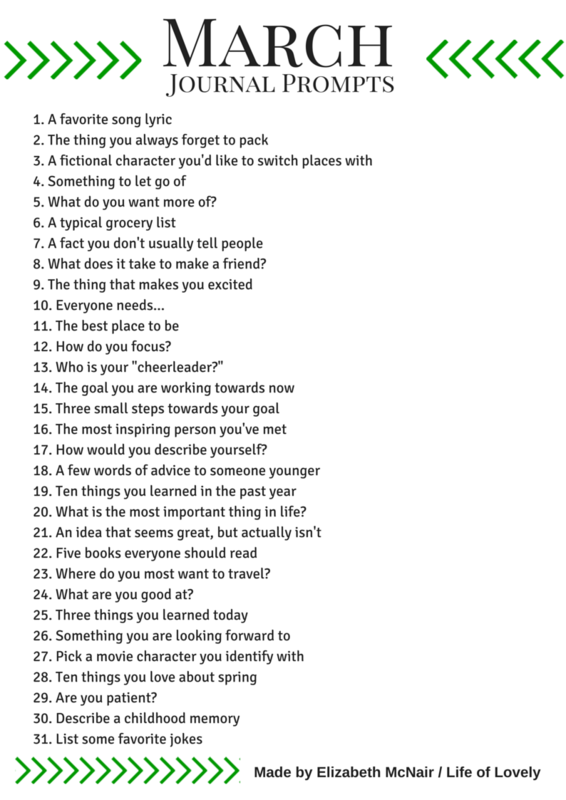 Great prompts! I always love extra lists of ideas!